Web Album Maker 3.0.0 free download. Web Album Maker is a web photo album creator that helps you create online photo slideshow from your digital photos using unique and highly professional Flash or HTML theme templates. Web Album Maker is a web photo album creator that helps you create online photo slideshow from your digital photos using unique and highly professional Flash or HTML theme templates. When you are finished, you can upload your photo album to your web site. The appearance of the generated photo albums can be fully configured through the use of skins or scripts. No need for extra software in order to view albums, just your web browser. If you have a digital camera and you want to share your pictures online, this amazing software will help you convert your images into a web gallery. With Web Album Maker, you can easily design your page layout and adjust image properties and thumbnail effects. With clicks, Web Album Maker creates HTML photo albums, JPEG thumbnails, and CSS for your online photo albums. It can create thumbnails of your photos and display them in index pages in HTML. It can also produce slide shows of your photos for easy navigation. Some people like online photo-sharing services such as Flickr or PBase, some prefer to create their own albums on their own sites. Web Album Maker is a unique software tool to help build online photo albums which meet all these users' requirements. Computer users who are looking for a powerful, simple utility to create their own web photo albums may find this one of the best choices available. 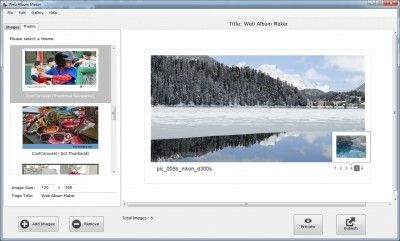 Web Album Maker is a powerful and easy-to-use tool to create picture galleries from digital photos and pictures. It's so simple! Using wizard-style interface the utility can accomplish your tasks with only few mouse clicks: just add desired pictures and press the "Generate" button, and you are done. Yet, it's powerful! You will experiment with various options and easily customize your photo gallery according to your preferences. CyberFresco is the easiest way to make online photo albums. Code generator html picture , generator html layout , code generator html image , photo album creator , online photo album creator , album creator download free photo free photo album creator. Expectal Photo Gallery is a free and useful application that presents your photos on your website in a professional manner.